Star Trek: The Next Generation was the television series sequel to the original Star Trek. The sequel series, which aired in syndication for 7 seasons from 1987-1994, featured the crew of a new starship Enterprise in the 24th century. Most of the firearms seen in the series were used in holographic simulations on the 'Holodeck' or when the characters were involved in time travel. In Season 5's "Time's Arrow, Part I" (S05E24), an archaeologist shows Captain Picard and Commander Data a 19th-century revolver in a cave beneath San Francisco. 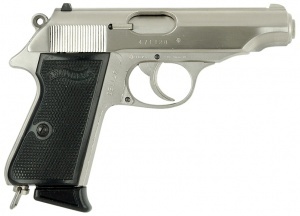 Data describes the weapon as a ".45-caliber double action Cavalry pistol, invented by Colt Firearms in 1873." 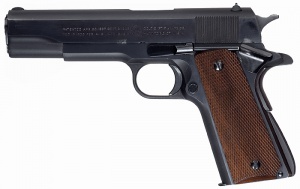 In fact, the weapon is a Colt Single Action Army, and Colt firearms did not make a double-action pistol in 1873. 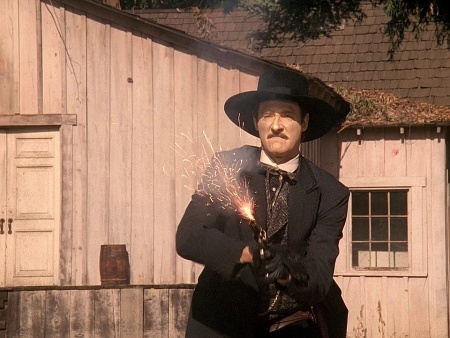 In the second part of that episode, Season 6's "Time's Arrow, Part II" (S06E01), the weapon is held by Samuel Clemens (Jerry Hardin) when he confronts the Enterprise crew in the cave, revealing how it came to be there. In Season 6's "A Fistful of Datas", the same pistol is used by several characters during a malfunctioning holodeck simulation of the Old West, including Lt. Worf (Michael Dorn), Counselor Troi (Marina Sirtis) and Commander Data (Brent Spiner). 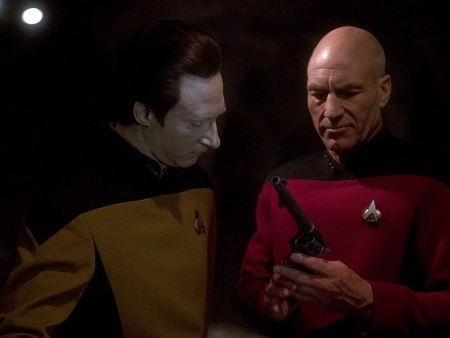 In Season 5's "Time's Arrow, Part I" (S05E24), Captain Picard (Patrick Stewart) examines a 19th-century revolver, which Data incorrectly identifies as a ".45-caliber double action Cavalry pistol, invented by Colt Firearms in 1873". 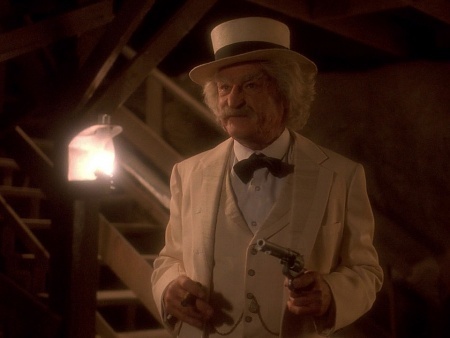 In Season 6's "Time's Arrow, Part II" (S06E01), the weapon is held by Samuel Clemens (Jerry Hardin), who remarks that "even time travelers are vulnerable to the Colt .45." Lt. Commander Data (Brent Spiner) as holographic villain Frank Hollander, fires his Single Action Army at Worf. 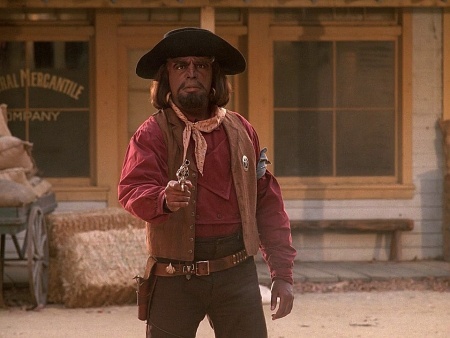 Worf (Michael Dorn) raises his nickel-plated Single Action Army. Worf quick-draws his SAA, managing to shoot Data/Frank's back-up gun out of his hand. In Season 1's "The Big Goodbye", holographic henchman Felix Leech (Harvey Jason) pulls a stainless Walther PP with pearl grips during one of Captain Picard's Dixon Hill simulations. Due to a computer malfunction, the holodeck's safeguards are deactivated and Leech shoots and critically wounds a crewman, on the orders of his holographic boss, Cyrus Redblock (Lawrence Tierney). In Season 1's "The Big Goodbye", holographic henchman Felix Leech (Harvey Jason) pulls a stainless Walther PP during one of Captain Picard's Dixon Hill simulations. 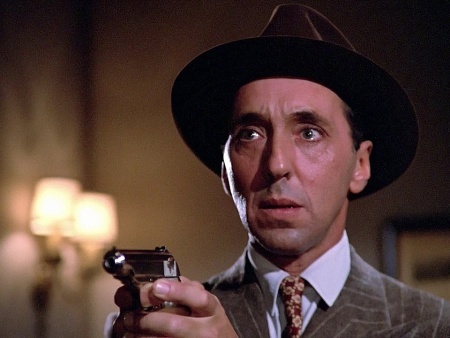 In the episode "The Big Goodbye", one of Cyrus Redblock's henchmen can be seen armed with an M1911A1, holding it on the protagonists. After Cyrus is defeated, Data takes the weapon from him and uses his superhuman strength to pinch the muzzle shut, rendering the pistol useless. 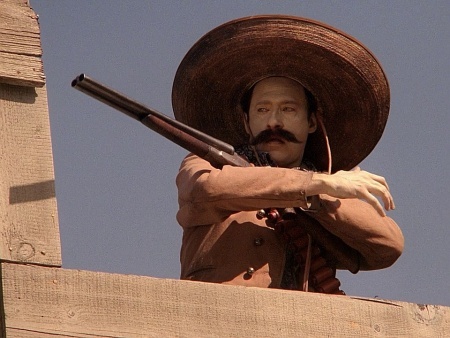 In Season 6's "A Fistful of Datas," Commander Data (Brent Spiner), whose likeness has been grafted onto a holographic Mexican gunfighter, wields a 12 Gauge Double Barreled Shotgun. In Season 2's "Hide And Q", the ape-soldiers created by Q (John de Lancie) carry Brown Bess Flintlock Muskets that fire explosive energy bolts instead of bullets. The weapons are also fitted with bayonets, which are used on the protagonists when the soldiers overwhelm them. Modern reproduction "Long Land Pattern" Brown Bess Infantry musket made from 1722-1768 - .75 caliber. In Season 2's "Hide And Q", the beast-soldiers created by Q (John de Lancie) carry Brown Bess Flintlock Muskets that fire explosive energy bolts instead of bullets. 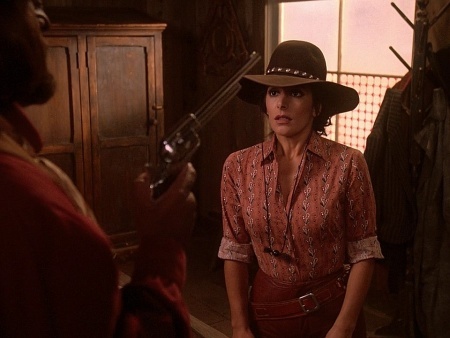 The Winchester Model 1873 is used by Deanna Troi (Marina Sirtis) in "A Fistful of Datas." Winchester Model 1873 carbine 44-40 Cal. 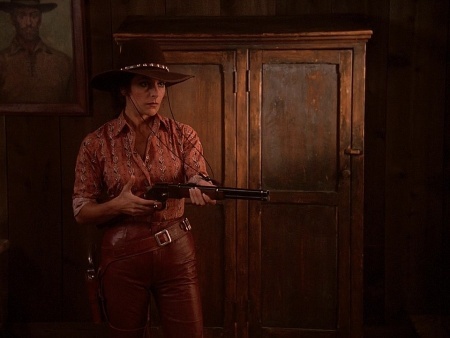 The Winchester Model 1894 is used by Deanna Troi (Marina Sirtis) and Data (Brent Spiner) in "A Fistful of Datas." In Season 2's "Manhunt", Jean-Luc Picard (Patrick Stewart) is playing one of his Dixon Hill mystery simulations when a simulated gangster (Robert Costanzo) bursts into his office brandishing a M1928 Thompson, the startled Picard ducks and yells for the computer to freeze the simulation before the gunman can open fire, even though he wouldn't have been harmed due to the holodeck's safeguards. 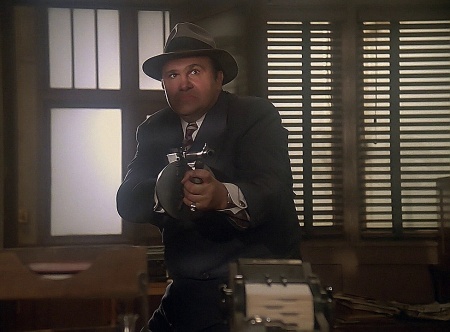 In Season 2's "Manhunt", a simulated gangster (Robert Costanzo) bursts into an office brandishing a M1928 Thompson.